You have opted for a ŠKODA – our sincere thanks for your confidence in us. You have received a vehicle with the latest technology and range of amenities. Please read this Owner's Manual carefully, because the operation in accordance with these instructions is a prerequisite for proper use of the vehicle. If you have any questions about your vehicle, please contact a ŠKODA Partner. We hope you enjoy driving your ŠKODA, and wish you a pleasant journey at all times. The on-board literature contains the following terms relating to the service work for your vehicle. “Specialist garage” - a workshop that carries out specialist service tasks for ŠKODA vehicles A specialist garage can be a ŠKODA partner, a ŠKODA service partner or an independent workshop. “ŠKODA service partner” - A workshop that has been contractually authorized by the manufacturer ŠKODA AUTO a.s. or its sales partner to perform service tasks on ŠKODA vehicles and to sell ŠKODA Genuine Parts. “ŠKODA partner” - A company that has been authorized by the manufacturer ŠKODA AUTO a.s. or its sales partner to sell new ŠKODA vehicles and, when applicable, to service them using ŠKODA Genuine Parts and sell ŠKODA Genuine Parts. These operating instructions apply to all body variants of the vehicle and all related models. 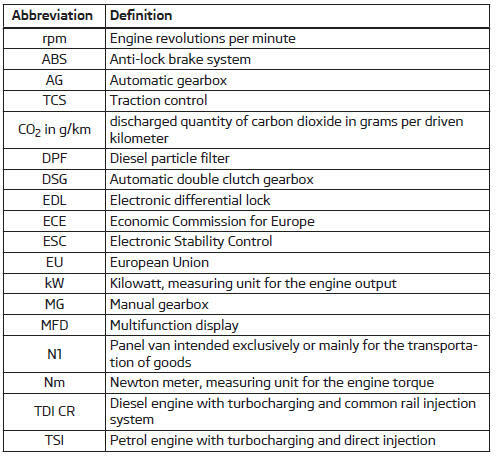 The manual describes all possible equipment variants without identifying them as special equipment, model variants or market-dependent equipment. Consequently, this vehicle does not necessarily contain all of the equipment components described in this Owner's Manual. The scope of equipment of your vehicle relates to your purchase contract for the vehicle. More information is available from the ŠKODA Partner from whom you bought the vehicle. The illustrations can differ in minor details from your vehicle; they are only intended for general information. The full type approval number of the means of transport is indicated in the registration documents.